Graduating seniors at San Diego State University have raised nearly $25,000 in scholarship money for future Aztecs, the school reported Monday. The donation was a slight twist to the usual graduating class gift of a picnic bench or fountain, according to school officials. Beginning in March, students who were getting ready to complete their studies were asked to give at least $10, and almost 1,400 responded. Aztec Shops — which runs the SDSU bookstore and other concessions — kicked in $10,000. “Ten dollars may not seem like much, but when combined with gifts from hundreds of others, it can really make a difference,” said Tammy Blackburn, director of alumni engagement, which spearheaded the “Leave Your Legacy Campaign” at SDSU. “We want to help students understand the importance of philanthropy so they continue to give for years to come,” she said. 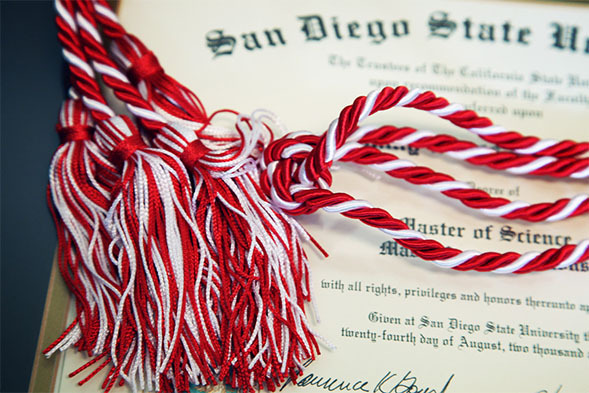 Students who gave to the campaign will wear a red and white cord with their graduation regalia during commencement this week, and they’ll be asked to stand during the ceremonies. More than 7,500 SDSU students will be awarded bachelor’s degrees in commencement exercises that begin Friday at Viejas Arena. More than 2,000 will earn master’s degrees and 171 will receive doctoral degrees.